My name is Allison Yamamoto-Sparks and I work for San Juan County Visitor Services, where I spend my days sharing my love of Utah (particularly SE Utah!) with people from around the world. 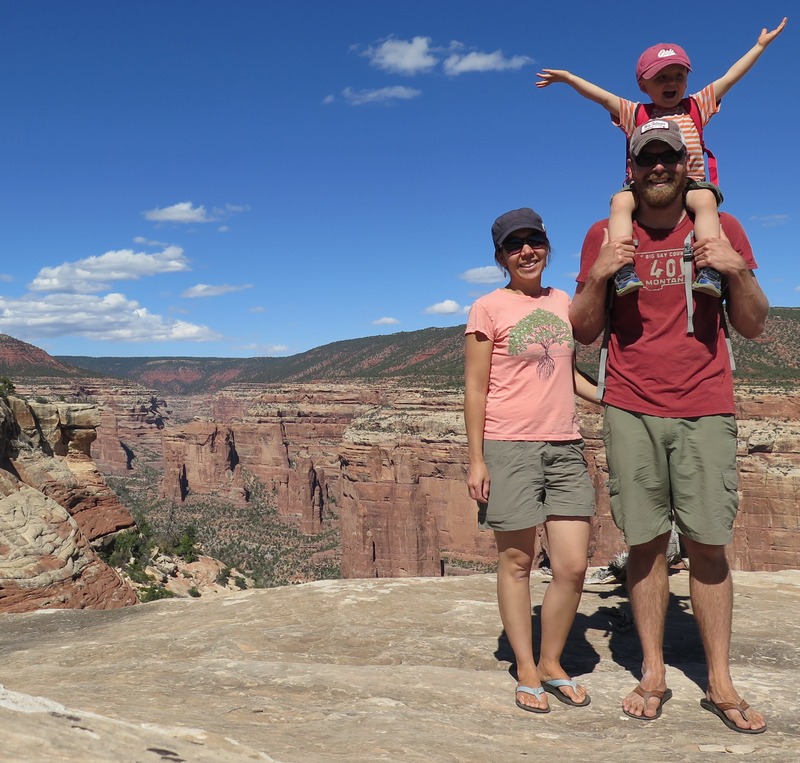 I blog, I instagram, I answer our toll free ‘Utah’s Canyon Country’ information line, I send out thousands of brochures each year, and I respond to e-mails from people all over the world who are planning trips to San Juan County, UT! Although I LOVE Utah and love sharing all the great things about it with anyone and everyone who will listen, I’m actually not a native Utahan. If you’ve been following my blog, I’m sure you’ve picked up bits and pieces- I moved to Monticello in March of 2009 from Missoula, MT, where I graduated from University of Montana (Go Griz!) in 2003 with a degree in Japanese & Asian Studies. I grew up mostly in Tiller, OR & Yakutat, AK, and have also lived in Bend, OR, Ketchikan, AK, and Tokyo & Ujitawara, Japan. In my free time I try to get out with my husband and son as much as possible and explore this beautiful area that we’re lucky enough to get to live in! We enjoy hiking, camping, cross country skiing, rafting/kayaking, looking for rock art & ruins, roadtrips, and FOOD! 🙂 My son loves going on ‘adventures’, and is already a much better hiker & camper at the age of 6.5, than I was until I was about 18! His favorite part of going on hikes? Finding the perfect spot to sit down and have a snack! Hey girl, spring has sprung you job needs done. Let’s see a new blog with no snow!!! Shauna- I agree! Jan-March is our busiest time of year with all the travel & sportsman’s shows we attend to promote the area and I apologize for getting WAY behind with my blogging! I just returned from my last show of the year last week, and am looking forward to doing some serious blogging! Should have a new entry up within the next few days! Thank you for your comment. I will respond to you directly at the e-mail address you provided. If you need info about a hike that I have been on, feel free to let me know what your plans are and contact me. I plan on adding something every week. Nathan- thank you for your comment. I bookmarked your blog and look forward to following your hiking adventures! Thankyou! feel free to suggest some places to go. I have a list, and there is always room for more locations. I saw your wonderful photo on TwistedSifter and I visited your blog then I found the word Ujitawara! I’m form Kumiyama where next to Uji and I know about Ujitawara of course. Yes, I know where Kumiyama is! Some of my co-workers in Ujitawara were from Kumiyama! Small world, isn’t it?! Yes it is! And pretty exciting! Ujitawara and Kumiyama are not well known like Uji but very relaxing places so I like them a lot. ありがとう! I agree- I loved all the small towns in that area, but it was also very nice to be so close to Kyoto! You might be just the person to help me figure out how to optimize my upcoming trip to Utah. I’ll be driving my new 2014 Miata and taking my new Nikon D800 and 24-700mm f2.8, 70-200mm f2.8, and 2x tele-extender, and tripod, from North Carolina, through a couple of stops in Texas to see relatives, and then through Santa Fe, up into lower Colorado, and then across to Utah. After Utah, I’ll go to Mt. Rushmore then back home, with not much stopping on the return trip. I plan to go in May, and I can time my trip to catch the full moon on 5/14/2014. I can shift my starting date in order to get the full moon at Natural Bridges, or Zion, or Bryce Canyon, or Arches. Which would you recommend? I also am trying to time the driving and hotels to get at least the sunrise or the sunset at each of these place (perhaps both). I realize that I might be trying to pack too much into the three weeks that I suspect that it will take me to make the trip. Thank you for your question- I’ve just responded to you directly to your e-mail address. Please let me know if there’s anything else I can help you with! Thank you for your comment- I’m glad you’re enjoying my blog! The campground at Natural Bridges is pretty small (only 13 sites) and I’m not sure how busy they are this time of year, but it can be difficult to get a site there. Luckily, there is a lot of FREE dispersed camping nearby! I believe they have a flyer with a map of nearby camping that they can give you at the visitor center, if you just stop in and ask. I hope this helps! Please let us know if there’s anything else we can help you with!